Wednesday, April 14th Everyone in our entire Yatra Camp has assembled in the courtyard to say an Ardas. 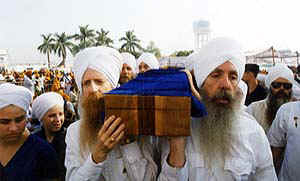 We are going to Keshgarh Sahib to present a special sword to the Siri Guru Granth Sahib. 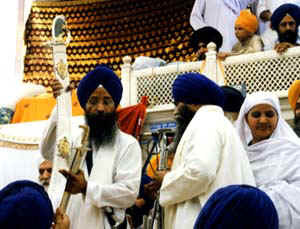 The sword is called the Sword of the Khalsa and it is presented on behalf of the Sikhs of the Western Hemisphere. The Sword of the Khalsa has been especially created for the 300th Anniversary of the Birth of the Khalsa. The main purpose of our yatra is, in truth, to present this sword to Guru Gobind Singh today. In the mid-seventeenth century, at the time of Guru Gobind Singh, the guru issued a hukamnama to all who respected him. Within this hukamnama the guru asked that devotees bring to the court of Anandpur Sahib, not presents of gold and silver, but of weaponry and horses. The Guru treasured the beauty of a strong sword and a steady horse above anything else. For with these gifts the sangat was empowered to fight for the freedom of spirit. The freedom of each human, man or woman, to live and worship free of fear and oppression. As representatives of Sikhs who today, in this century, live all over, the Western Hemisphere, we are taking this sword to Keshgarh Sahib. We hope it will be gracefully accepted as our gift to the legacy of Guru Gobind Singh. 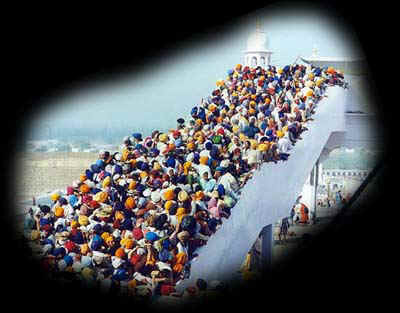 During the daytime, there is a 3-hour long line for pilgrims to bow their heads at Keshgarh Sahib. We are going early in the morning in the hope that we can physically move through the crowds and successfully present the sword. 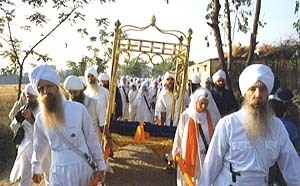 We walk from our camp at 7:30 a.m., carrying the sword in our midst on its beautifully decorated brass palki sahib. The students of Miri Piri Academy lead the way. Their incredible energy and presence literally crackles in the morning air. Dressed in their deep blue bana, the students form the point of our groups formation that allows us to pass through the crowds with a powerful projection. As we reached a point that was within a few hundred yards of the Takhat we realized that if we had any hope of presenting the Sword of the Khalsa to the Guru, we needed to move the sword from atop the Palki Sahib and onto the shoulders of a squad of men. We also concluded that if we broke from our larger group formation to leave our shoes, we would not be able to continue forward as a group. Keeping our shoes meant little in the scheme of the days event. We passed the word through our group "Forget about your shoes, just kick them off and leave them." Amazingly at this moment several sevadars spontaneously stepped forward from the surrounding crowd and took our shoes for us. Much later, when we returned we found that these kind sevadars neatly stacked and watched over every one of our shoes. At the bottom steps of the Takhat Keshgarh Sahib, was a solid mass of human beings. The crowd pushed and surged like the waves of an immense sea. One of my friends later told me that within this crowds surge he was lifted up off his feet and carried forward twenty feet before his feet again touched the ground. The strongest men and women in our group formed a protective circle several people deep around the squad carrying the Sword of the Khalsa. Each person locked tight together and by moving strategically through the crowd, we succeeded in finding our way to Guru Gobind Singhs weapons room at the top-most level of Takhat Keshgarh Sahib. By controlling the Gurdwara entrances and exits, our entire group was able to gain entry and completely fill the small Gurdwara. For over an hour, we held this space, no one stopped us; many in fact helped us, hold the physical space for our presentation. I have to say that this next hour in our journey to Anandpur Sahib, is one I will never forget. Throughout every day of this yatra, we were on call to present this Sword of the Khalsa. Every day the presentation time changed. One day we were to present the sword at 2:00 a.m., another day we were to present the sword at 7:30 p.m. Wed wished for an official time to present the sword but that time never arrived. So today, this final day, is our only opportunity. 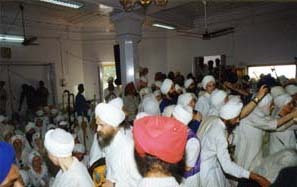 Filled with so many bodies, and with barely any air, the gurdwara was compressed and hot. The crowded setting made it difficult for many people to see what was happening and so as the sense of sight diminished the sense of sound increased. 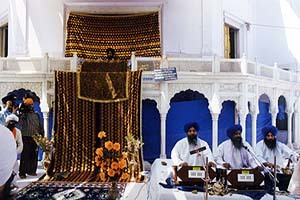 The continuous chanting of SAT NAM, WAHE GURU seemed to literally make the room rumble. As I stood waiting and chanting, I wondered what would happen next. I knew that this moment was unprecedented in time and place; a moment that has never been before and will never be again. At the same time, I felt both anxious and blessed to be holding a space within this takhat. Anxious, because I feared the unknown. I knew there were so many people outside waiting to bow at this takhat today, but I did not know exactly what would happen next. The instant I thought this thought, I felt transported in time to the Amrit ceremony of 1699. I felt as if I was one of the many people within the crowds who were anxiously wondering about the fate of the five beloved ones, and in effect the destiny of the Khalsa. The difference of 300 years seems to melt away. I thought, "What little difference there is between then and now." Then Guru wanted the fearless to give their heads for truth. And now, at this time in history too, truth and the caliber of Khalsa must prevail. In the next moment, my attention was drawn back to the present. I saw that Siri Singh Sahib Harbhajan Singh Khalsa Yogi and his family were slowly moving through the doorway. Although his physical strength is not what it was in his youth, some how, the Siri Singh Sahib managed to move through the pressing crowd and entered the Gurdwara to stand before the Siri Guru Granth Sahib. With folded hands, he bowed. The Gurus granthi came forward and put a saropa around his neck. Then the Gurus granthi placed a saropa on the neck of his wife Bibi Inderjeet Kaur as well. Siri Singh Sahib ji was also presented with a golden plate that was inscribed with a special message of gratitude from the Takhat Keshgarh Sahib. 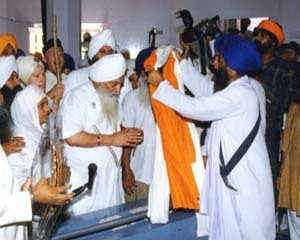 Then, the Sword of the Khalsa was passed through the crowd to the Siri Singh Sahib, and with a low bow, he officially presented it to the Granthi, who in turn officially presented it to the Guru. The sangat within the gurdwara exploded with a loud cry of "Bole so Nihal, Sat Siri Akal!". The power of this moment was very intense. The Khalsa presented the Sword of the Khalsa to Guru Gobind Singh and at that same instance the Khalsa also came home to Guru Gobind Singh. After the presentation of the sword, we freed the entrances and exits and moved down to the main darbar on the next level outside the Gurdwara. A huge sangat was gathered there. As is part of the Baisakhi tradition, Jathadar Manjit Singh showed, one by one, the weapons of Guru Gobind Singh, telling the impressive history and details of each. At the end of this presentation, he presented to the sangat the Sword of the Khalsa. He also announced that this sword for all time would remain with Guru Gobind Singh's weapons at Takhat Keshgarh Sahib. When the Siri Singh Sahib stood to address the sangat, he said, "Your hand has extended longer than you know. Time will tell, people will tell, nine-hundred sixty million we will be!" 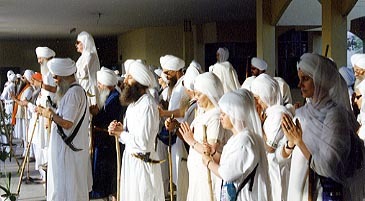 Later that day each one of us was honored as the Gurus torchbearers. Siri Singh Sahib Harbhajan Singh Yogi, Bibi Inderjeet Kaur, Dr. OngKar Singh and each one of us on the yatra were given saropas by Professor Manjit Singh, Jathadar of Keshgarh Sahib. Late in the evening, when the crowds cleared, I had the opportunity to return to the Takhat Keshgarh Sahib to bow once more before I returned home. I saw that the Sword of the Khalsa was, just as we hoped, kept together with Guru Gobind Singh's weapons. It is a tremendous blessing to see the Sword of the Khalsa together with the many awe-inspiring weapons of Guru Gobind Singh. It is not hard for me imagine Guru Gobind Singh physically fighting for the Khalsa Panth with these weapons. I realize too that all these weapons here today are here to inspire us, to uplift our spirits, and to help us remember that we too can manifest the greatness of Guru Gobind Singh, the father of the Khalsa.